If you want to learn how to make gelato, you're in for a real treat. Making this cold, creamy dessert at home can be a lot of fun, and enjoying the end results is the best part! 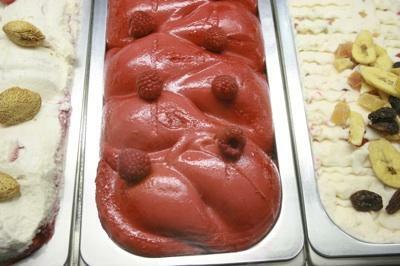 Gelato shops, called gelaterias, often use specially designed commercial machines that freeze the ingredients to the proper temperatures and prevent the mixture from filling up with extraneous air (called overrun). While it would be nice to have a machine just for making perfect gelato, you can just as easily make your own at home with just your regular ice cream maker. This gelato recipe will give you a good base that you can either flavor or drizzle with your favorite toppings. Try hot fudge and strawberries! In a saucepan, mix milk and cream. Heat until bubbles begin to form around the edges, and then remove the pan from the heat. In a large bowl, beat the egg yolks and sugar on high until they are nice and foamy, about one minute. Gradually pour the warm milk and cream into the egg yolks, whisking constantly as you do. Pour slowly, otherwise the warm milk will cook the yokes and ruin your gelato base. Wipe out the saucepan, pour the milk and egg mixture into it, and cook over medium heat, stirring contantly with a wooden spoon until the mixture thickens a bit and coats the back of the spoon. If you begin to see lumps, remove the pan from the heat. Pour the mixture through a fine strainer into a bowl. Cover the bowl and chill it in the refrigerator for several hours. Pour the mixture into your ice cream maker and freeze following the instructions that came with the machine. Variation: For amazing vanilla flavor, try adding 1/2 teaspoon of vanilla extract during step 5. If you're still looking for more information on how to make gelato, here are some recipes, info, and tips that will help you out. If you're looking for a book on how to make gelato, check out "Gelato!" by Pamela Sheldon Johns (2000, Ten Speed Press). This pistachio gelato recipe is a sure-fire crowd pleaser! Check out these competing chocolate gelato recipes to see which one you like best. If you're interested in really investing in your home gelato habit, check out some gelato mixes. There's an entire science to scooping gelato. Learn how to create the perfect scoop! Once you mastered making the gelato base, you can begin experimenting with a variety of flavorings and add-ins. For example, you could try adding espresso powder to make coffee gelato or adding some cocoa powder for a delicious chocolate gelato. There's just nothing else like the creamy goodness of this frosty treat, so don't be surprised if you develop a passion for making your own.